When Google is updating Page Rank (technically is Google releasing Page Rank status to Google Toolbar or Google Directory so that they will reflect the latest Page Rank), it will normally takes a couple of days to propagate the Page Rank to all Google servers across the globe. So your Google Toolbar might not reflect the final new PageRank during an update. To check out what PageRank your website might be after the upcoming update, there are several tools that help you to get to know what is the possible Page Rank value of the URLs. Note: PageRank is no longer as important as it used to be, and is no longer published officially by Google through Google Webmaster Tool. As the result, most of the PageRank tools no longer work. 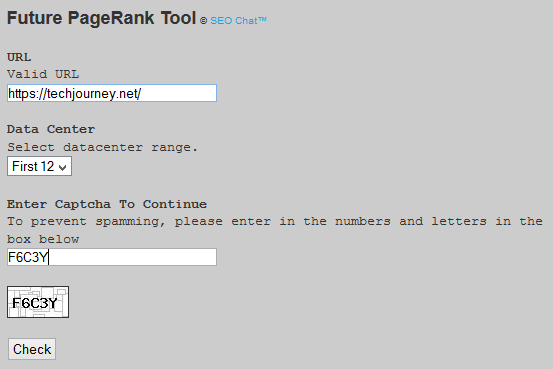 Other PageRank checking tools are from PageRankTool, Pagerank Check and McDar Datacenter Quick Check (no longer available).